Healthy Chocolate Mayesa a Triumph at Natural Products Expo West! Healthy chocolate is a hit! We had a successful – and fun! – time at the Natural Products Expo West in Anaheim, CA, this past weekend of March 8-11. And we met some new friends! Natural Products Expo West – Mayesa Will Be There! Natural Products Expo West is being held March 8-11 at the Anaheim Convention Center, and we’ll be proudly displaying Mayesa! And what does that mean for you? We’ll be talking with representatives from many different types of businesses who sell healthy products just like Mayesa. These businesses include conventional supermarket and grocery stores, gourmet specialty retailers, natural product chains, health practitioners, and natural food restaurants. We’re excited to be attending the largest natural, organic and healthy product trade show in the country! 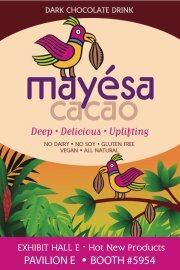 This will bring our wonderful healthy chocolate Mayesa drinks to the attention of thousands of industry professionals. Expo West will see our debut of three new flavors, and our brand-new packaging! And soon you’ll have many more options of where to buy your favorite Mayesa drinks!